when I compile the project I had no error but many warnings does this affect my work. when I validate changes in engineering change order I get " failed to add class member" but later I found all the components in the pcb sheet. B.walid is a new contributor to this site. Take care in asking for clarification, commenting, and answering. Check out our Code of Conduct. You are getting all of those "Wire has multiple net names" warnings because many of the nets are going through sheet entry ports, and perhaps connected to other-named nets on other sheets. Net naming is Altium is configurable in the project options->options section (for example, search for "Allow ports to name nets"). You need to become familiar with the available net options, how they impact your design, and choose the best set of options that will work for your net structure (Flat, Hierarchical, Global, Nets named by ports, and so on). The selections you make will restrict how you can name nets, and what Errors or Warnings are generated due to unexpected connections. For example, I most commonly disable "Allow ports to name nets", and prefer to name nets manually using net labels (much like you appear to do). The warnings about failing to add a class member can also come up for various reasons. Most commonly it also involves settings in the project options (class generation and comparator sections). I think this warning indicates that the update process was not able to add a class generated by the schematic to a class in the PCB. This may be really important, or benign, depending on what you intend to do in the PCB side. Fix the net issues first, then see if the class warning is still present, and deal with the class issue then. Warnings do not stop the update process. However they do try to indicate that perhaps something in the options, setup, or design may not be ideal, and you should investigate why. You can configure if a specific issue should be flagged as a Warning, Error, Fatal Error, or to just Ignore in the Options-> Connection matrix section. In summary, there's a ton of stuff to be aware of, and to configure. That is simply a side-effect of trying to design flexible software for the professional masses. Warning are only an issue if you don't know where they come from. That depends on your schematic, layout and rules. Without more details, there's not much we can do to help you with that. 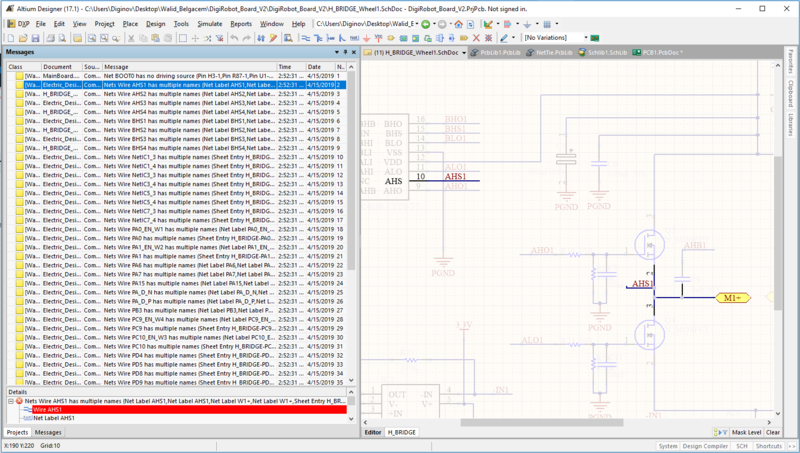 As for the validate issue, that's a "feature" of Altium; if you validate an import, it tries to validate the circuit that exists in layout, which doesn't always include everything required if you've changed the schematic since your last import. This means that a validate will fail, but if you execute in import, it will run fine. Check the errors after completing import. B.walid is a new contributor. Be nice, and check out our Code of Conduct. Not the answer you're looking for? Browse other questions tagged altium or ask your own question.